Arbitrage is defined as the simultaneous (or near simultaneous) purchase and sale of an asset to profit from a disparity in price. Arbitrage has long been a popular trading method in the stock market, as it is very straightforward and is perceived to be a low-risk strategy. How Does Arbitrage Differ in the Cryptocurrency Market? Though the asset in question may be different, the general principle of arbitrage is the same in any market. In other words, Bitcoin arbitrage works the same as stock arbitrage, in theory. There are, however, a few wrinkles that are specialized to the cryptocurrency realm. First, volatility in the cryptocurrency space is much greater. This volatility can be a positive factor for arbitrage. Sharp and sudden changes can create significant disparities in price across exchanges. It is not uncommon for digital currencies to experience a 25% drop in a 24-hour period. Additionally, the cryptocurrency market is largely unregulated with more than 200 exchanges currently operating globally. These current conditions can be quite favorable in terms of creating large price disparities between exchanges. Arbitrage in cryptocurrency is also dependent on technology. In manual arbitrage, the transaction speed of the coin can make a significant difference. Some coins arrive near instantly when sent to an exchange wallet; others can take up to 20 minutes to arrive. This should be a significant consideration for anyone seeking to manually arbitrage across two exchanges. This means that “Stock A” can be bought for $50 and immediately sold for $50.08, earning an eight cent profit per share. This arbitrage opportunity can be exploited until the price equalizes or the trader runs out of capital. The same process can be repeated on cryptocurrency exchanges, where disparities are typically both more significant and more frequent. A trader may spot Ethereum trading at $305 on one exchange and $306 on another, then send a fast-moving crypto asset between exchange wallets to use as an exchange medium, and profit from the gap in price. Price disparities on cryptocurrency exchanges can arise for many reasons. For example, geography plays a role: For much of 2017, coins in South Korea traded at a substantial premium (as much as one-third higher in some cases). Low liquidity levels may also influence a coin’s price, as some buyers may not be able to sell when the order books are thin on a particular exchange. A trader may be able to exploit this and resell on an exchange with greater liquidity. Listing-arbitrage represents another key opportunity in the cryptocurrency space. Newly listed coins tend to spike significantly upon announcement by a major exchange. When developing an arbitrage strategy, you can choose to proceed manually or opt for the assistance of a bot, or cryptocurrency arbitrage software. To arbitrage cryptocurrency manually, a trader should monitor the price of an asset across a variety of exchanges in real time, and be prepared to arbitrage once a disparity is revealed. There are websites and apps available that assist with the monitoring of crypto prices across various exchanges in real time. It’s also possible to arbitrage on a single exchange by using different pairings. For example, an altcoin may be paired with Bitcoin and Ethereum, but have slightly different prices for both. If the Bitcoin pairing is cheaper, a trader can buy the altcoin and then immediately sell it under the Ethereum pairing. Trading bots operate on the same arbitrage principles but have certain advantages that human traders can’t replicate. First, an arbitrage bot is faster — and speed is essential when using this method. Second, an arbitrage bot never needs to rest, eat, or do anything except hunt for price disparities. A cryptocurrency arbitrage bot scans for and detects gaps in prices and executes orders for a profit. Some bots are limited to arbitrage on a single exchange; other, more powerful software programs (such as the HTS Inter-Exchange Arbitrage Bot) will detect price gaps on multiple exchanges and execute a profitable buy and sell, assuming the coin pairings are available on both platforms. HTS is one of the few platforms offering a bot that supports this trading method. An advanced arbitrage bot can play a critical role in trading success, as it has the speed and endurance to maximize opportunities. To achieve optimal performance, however, it’s essential that the user configure the bot properly and understand any restrictions (such as the need to manually re-balance a wallet). Traders may also supplement automated trading with manual arbitrage opportunities. In this case, studying patterns in the order books in real time can help traders identify price disparities before they occur. Ultimately, with enough research and due diligence, a trader can develop an arbitrage strategy that delivers consistent results. 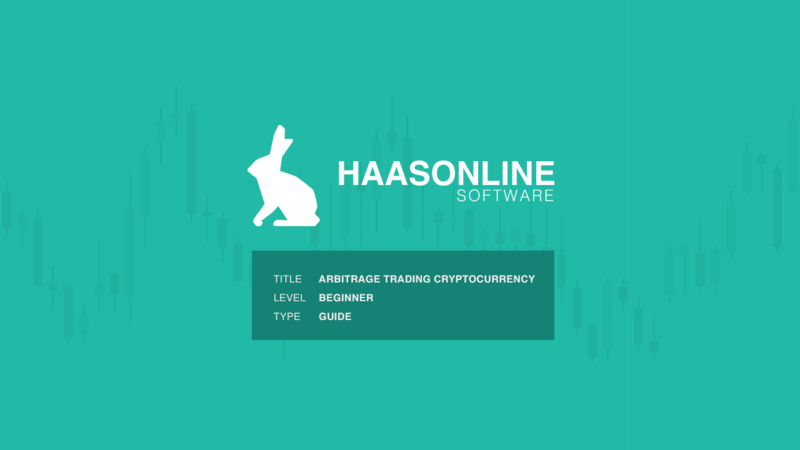 Arbitrage is a popular cryptocurrency trading strategy for a variety of reasons. It offers limited downside risk, it works in up, down, and sideways markets and it’s an easy technique to understand. There are some considerations, however. While the risk is limited, it does exist; if you’re trading manually, it’s possible to get stuck holding the bag if you can’t arbitrage quickly enough. Arbitrage also requires some legwork, as you’ll need to open accounts at various exchanges and ensure your software is optimized. If done right, however, arbitrage is a highly effective technique. By using the right set of tools, you can place yourself in the best possible position to profit.